After reading the title of this post, you’re probably asking yourself: What’s wrong with the display templates today in SharePoint 2013? Why would I want to replace them? Our client was looking to customize many different Content Search Web Parts in order to build modular pages with entirely search-driven content. This included getting a large chunk of data from search and filtering / sorting by a custom Managed Metadata column in the display template – which made Angular the perfect candidate. 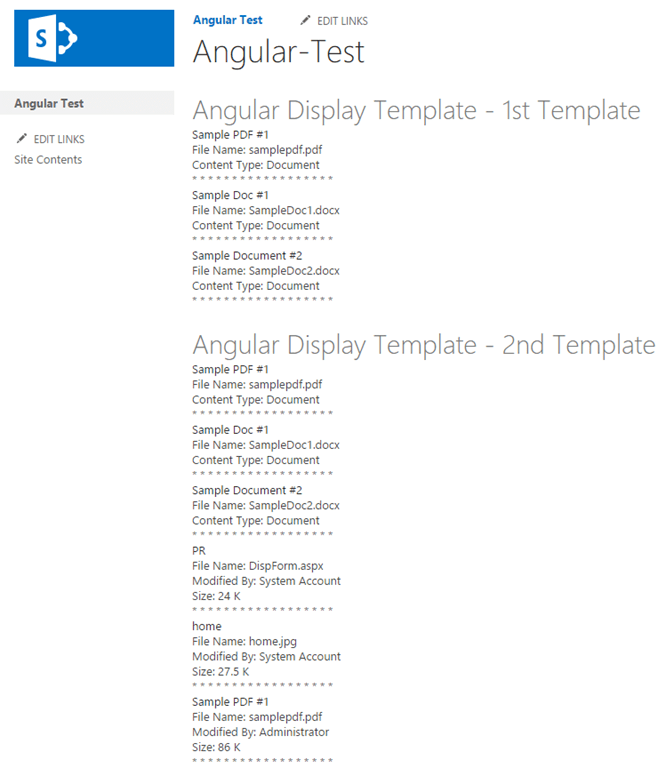 While looking into adding Angular to a display template, I found an excellent blog post by Elio Struyf on the subject. As great a foundation as this article is, I found myself looking for something “more” to reach my end goal. For my client, the ability to have more than one Angular web part on the page was crucial – which proved a little difficult without some extra intervention. Second, we needed the ability for web parts to “share” data – to be able to get data from two result sources and display them combined in one table. Plus, a little stronger architecture and mode code structure couldn’t hurt. First, I added a line in each Control template that saved its ctx object as a global variable (firstCtx and secondCtx, created in WP_Control_FirstControltemplate.html and WP_Control_SecondControlTemplate.html, respectively). 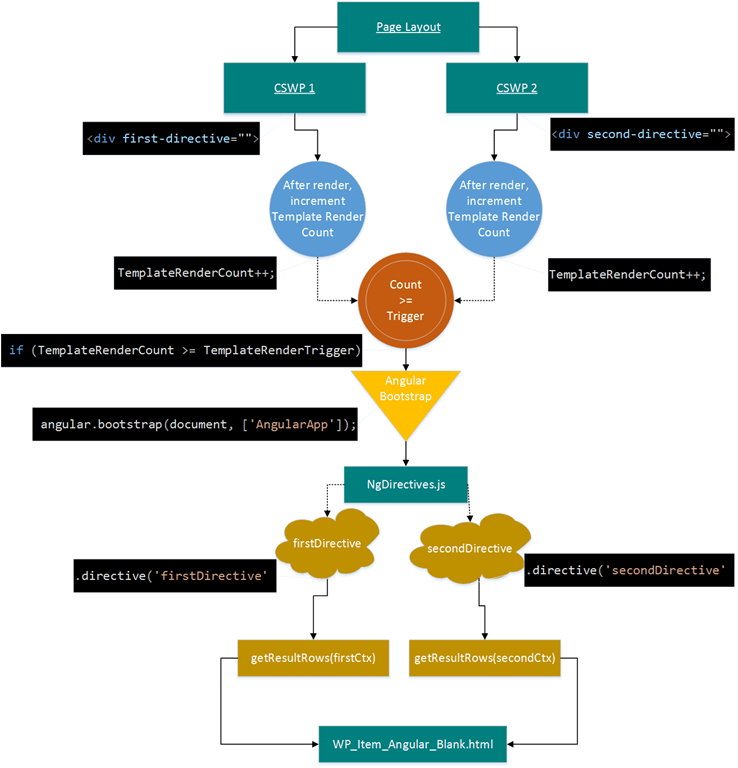 This effectively creates a snapshot of the ctx object at that point in time. Additionally, I added a reference to the directives we’ll create in NgDirectives.js in each Control template. This will execute our directive once we’re all ready to go. Next, I followed Elio’s instructions to create a “dummy” item template that contains the Managed Property Mappings to be used. I called this WP_Item_Angular_Blank.html. Each Directive calls getResultRows, which works some of Elio’s magic to look into the Angular_Blank Item template, execute it, and grab the managed property mappings inside. Now, we’ve modified the ctx object in the exact same way that our Item Template would. So, in getResultRows(), we can now save our custom properties using $getItemValue() on the ctx. getResultRows() now returns the entire data set back to the directive, which is saved in the directive’s scope and can now be utilized in the Angular Template. 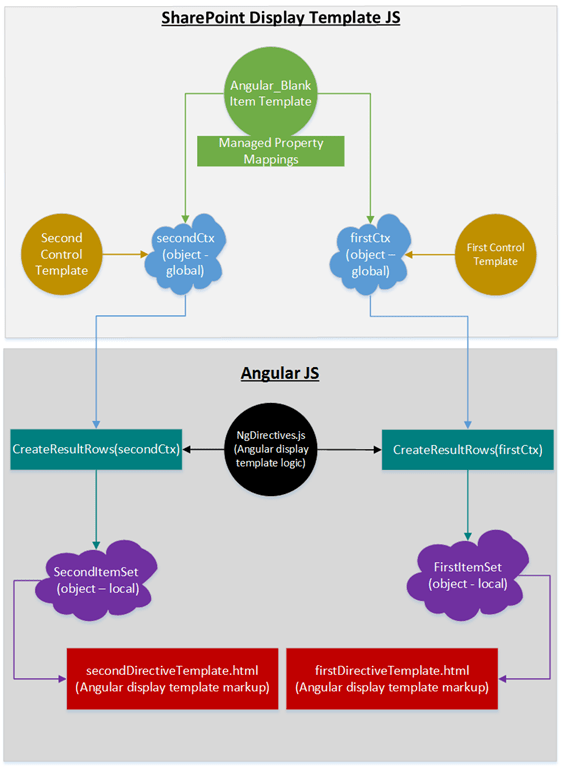 Now, here’s one of the issues I encountered during implementation – executing the Angular directive. In Elio’s example, he only has one display template with Angular on the page, so execution isn’t a huge issue. However, with multiple Angular display templates, we ran into difficulty while running angular.bootstrap(document, [‘AngularApp’]) – sometimes it executed before all of the display templates were rendered. This led to our page being unstable and web parts randomly disappearing on refresh. This function lives in HelperFunctions.js, increments the global variable, and then checks to see if all of the templates have rendered. This opens up even more possibilities to leverage Angular with these data sets – we can filter and group based on a column, we can combine like items from multiple result sources, etc. As you can see, this provides us with a much more extensive code platform to work with than traditional SharePoint display templates. If you’d like to download my full sample code, you can find it on GitHub. I’d also like to credit Steve Samnadda and Dev Deol for working on this solution with me! Questions? Want to tell your friends about how awesome this blog post is? Feel free to comment below or share this article.